This article is about signing into a Royal Bank of Canada online banking service, if you are an owner of a business account or a holder of the credit card emitted by this bank. Both these cases allow you to sign in to RBC Internet banking account and perform any operations over your funds. For credit card holders and personal accounts, the technique of signing into a RBC service is quite simple. Open the page for online banking and click to a “Sign In” button. You will see the prompt for entering with your RBC credit card number or a registered username (see the next chapter for details), and your password. Enter these parameters and, again, proceed with clicking a “Sign In” option. You will enter your RBC online bank. Creating and managing a business account is a more difficult action than for personal accounts. It often requires a personal contact with a branch of RBC Bank to ensure all details. Still, having this account, you may use it for signing in from a Royal Bank business banking online page. This is a common flaw. Do not afraid, and click on the “Recover Password” link just about a password field. You will be prompted for a few necessary actions to verify your password reset. After that, you will obtain a new password for a RBC Internet bank. (Please note that you must have not only a credit card number and a digit issue (CVV), but also a bank account number to set up your sign in for Royal Bank credit card banking online). Provide all data required about your banking card, and click on “Continue” to proceed. On the next steps, type your personal data required for creating a RBC sign in form, such as a unique password. Note: When you select your password for a bank, avoid obvious or too personally affiliated combinations such as a birthdate. Use the maximum of your creativity for your security! If you afraid to lose the very difficult password, we can recommend you to keep your passwords in some dedicated key-storing utility, such as Handy Password. These utilities can remember all your keys and sign in names, guarding these data under the protection of a master key. Another way to raise security is a self-restriction of using the business or personal RBC banking data on a public, with public terminals or even from some mobile device. In all these cases, your data can migrate to other hands very quickly, compromising the safety of your funds. 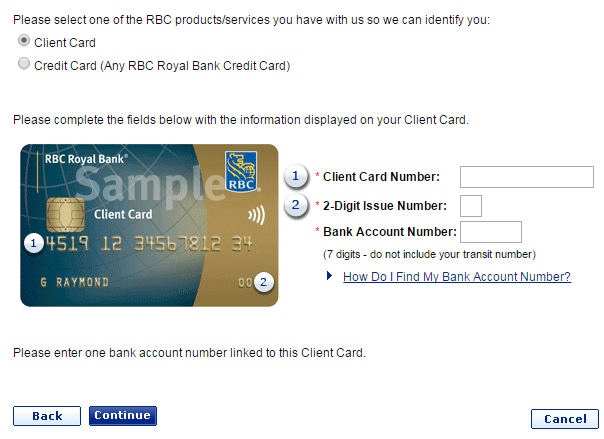 Note: For protecting RBC business accounts, some extra security measures are described on the RBC bank website.